From the sophisticated greys and blacks of Laura Bailey‘s expertly created look to the seductive dark eye/fuschia combination rocked by Melissa George, yesterday’s BAFTAs saw a smokey eye renaissance. Create an artfully textured smokey eye with the Guerlain Ecrins 4 Couleurs palette in ‘Les Noirs’ with its mix of satins, iridescents and matte shades. Apply the lightest shade all over the lid, and smoke up the socket with the fluffy end of the Stila Crease and Liner Brush and the dark grey shade. Finish by defining the eyes with the liner end of the brush and the matte black shadow, together with lashings of the eye framing Dior New Look Mascara. 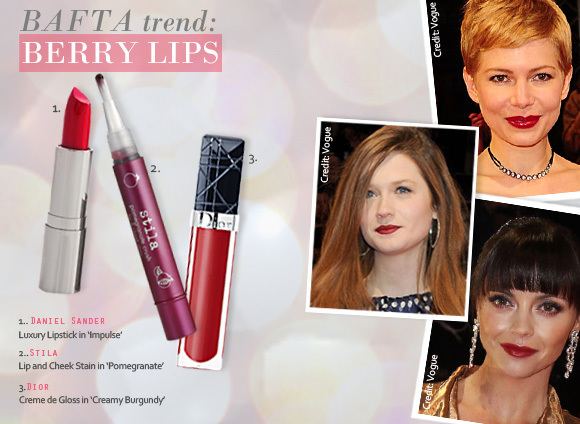 With winter not quite off the radar just yet, sumptuous berry-hued lips were a big feature. Where Michelle Williams wore hers glossy and bright, Bonnie Wright opted for a matte finish in a gorgeous shade of wine red. Start off by gently buffing the lips with a scrub, as darker colours are not as forgiving on drier skin. Line the lips with your chosen colour to shape your pout, before filling in completely. To make the colour last longer, blot your lips on a tissue, and then reapply. Try the Dior Creme de Gloss in Creamy Burgundy for high shine pigmentation, Stila Lip & Cheek Stain in Pomegranate for a long-lasting plummy red, or the Daniel Sandler Luxury Lipstick in Impulse for a creamy red-pink with excellent colour pay off. 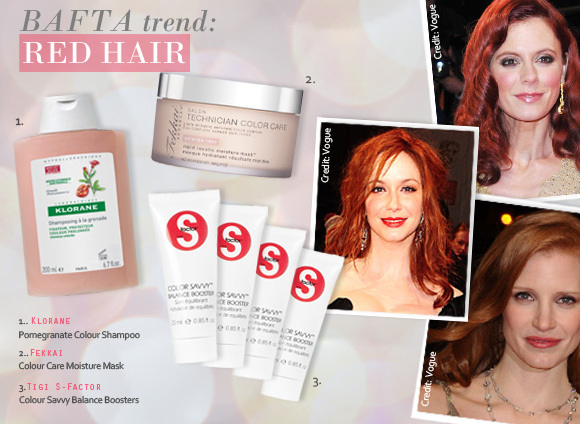 From the copper blonde tresses of Jessica Chastain to Christina Hendricks‘ voluptuous and fiery hue, red hair is big news. When hair is dyed red it is notoriously difficult to retain its vibrant hue, so make sure you wash hair with a gentle shampoo that will not strip the colour out. The Klorane Pomegranate Colour Shampoo is ideal for this, with natural extracts and a low lathering formulation that infuses hair with moisture and shine. Popping on a colour saving treatment once a week will prolong the life of your red, too. Choose from the Fekkai Colour Care Moisture Mask or the Tigi S-Factor Colour Savvy Balance Boosters set to keep your locks looking and feeling beautiful. The lips feel comfortably moisturised, without feeling sticky or heavy. I bought 2 shades and they are expectedly pigmented, more than general lip glosses. It's also acceptably shimmery (silver shimmer). The staying power is a bit less than stated as it depends on what you eat or drink, generally it stays not less than 4 hours. This is simply the only gloss I will buy when I wanna try some other shades. Thanks the web site for the best service, packages always arrive in Sweden on the 4th day, as expected. This entry was posted on Monday, February 13th, 2012 at 4:23 pm and is filed under Haircare, Make-up, Special Post, Trends. You can follow any responses to this entry through the RSS 2.0 feed. You can skip to the end and leave a response. Pinging is currently not allowed.